"The Ultimate Disco Whatever The Occasion"
Established in 1992, Starstruck Roadshow has over 26 years' experience within the mobile disco and DJing industry, and provides a personally tailored entertainment service to customers, both old and new via our best form of advertising which is customer recommendation. We are based in Norwich. The Roadshow is owned and presented by Mick Laney who has been associated with the DJing / Karaoke entertainment industry since the early 1990s. Having previously entertained and performed within many clubs, pubs and nightspots, Mick has a vast amount of experience helping him to manage and help ensure that Starstruck-Roadshow provides a quality entertainment experience for your party, wedding or event. Starstruck-Roadshow provides a professionally tailored mobile disco or karaoke service incorporating professional grade modern light/laser and digital sound equipment, and the added peace of mind that your party is being hosted by an experienced personality DJ on the microphone. (Remember the entertainment can make or break your party or taint your special day!). We are committed to provide the most competitive rates and disco setups to suit all budgets /styles and venue sizes without the need to comprimise the quality and enjoyment of the entertainment that your guests receive. Required by many venues, Starstruck Roadshow has a current PLI policy with Mobile DJ Network in the amount of £10 million. Also required by many venues, Starstruck Roadshow has supplied satisfactory evidence of holding current PAT inspections of their equipment dated within the last 12 months. A Method Statement, outlining Starstruck Roadshow&apos;s Health & Safety procedure for setting up disco equipment has not been supplied. Why do people choose to book Starstruck Roadshow? Local to area, setup looks lovely. "Very pleased all round. Needed a DJ at short notice and everything was arranged so quickly and easily. Would defiantly recommend Mick, had a lovely night! " "Fantastic service, will use again. " "Thank you....im pleased you enjoyed your evening"
"Michael was very good. One of the best dj's we have had down here for music choice, variety and also audience participation. would be 1st choice to book again here at our hotel"
Starstruck Roadshow also offers a range of additional party services not directly linked to musical entertainment. 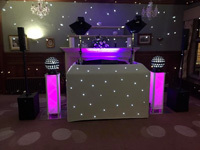 Get FREE no-obligation disco quotes from Starstruck Roadshow and other DJs covering your venue. Take 2 minutes to fill in some basic details and we'll do the rest! If you are contacting Starstruck Roadshow about an event, it's always a good idea to include the DATE, LOCATION, EVENT TYPE, AGE GROUP and TIMINGS to speed things up!